The full set hasn’t been spoiled yet (for up to date info, here’s the official WotC Card Image Gallery), but now that we know what the new keywords are we can take a look at them. Here’s the mechanics page that WotC has usually thrown up for the past few sets (and I like them, they’re very helpful) so that we’re all on the same level here. We’re not going to talk about the “Loners” or “Flickering” mechanics because those require the whole set to be examined and we don’t have that yet. Undying is returning, and unless we’re talking about adding new enters the battlefield abilities, I think we can let that go. It’s ok, we’ve got two new keyword mechanics that we can turn our attention towards. Obviously headlined by the above card, this the new mechanic everyone is talking about. Ok, more like everyone is fearing that this card is going to take over every format ever since there’s numerous ways to manipulate the top card of your library. And Temporal Mastery’s Blue. That automatically makes it good. Banishing Stroke – Puts an artifact, creature or land on the bottom of the library. Temporal Mastery – Takes an extra turn. 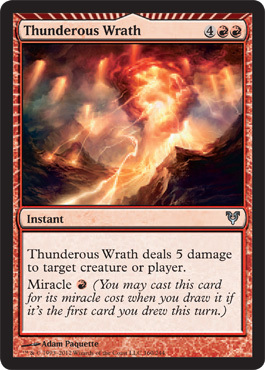 Thunderous Wrath – Deals 5 to a single target. What we get with Miracle is the chance to play something cheaper, if we’re willing to spend mana on it right away and it’s the first card you draw a turn. This leads to some hijinxs with drawing on an opponent’s turn (which is why players are afraid of Temporal Mastery since you can cast Miracles anytime it’s the first card you drew in a turn). 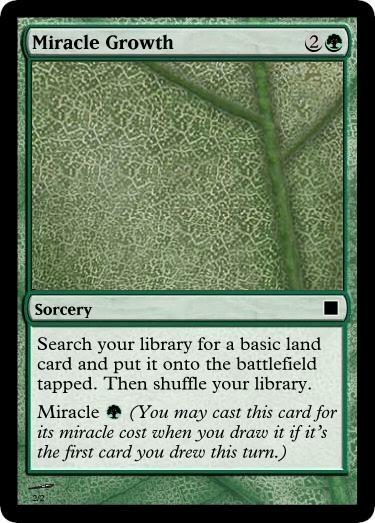 With Miracle you can get a huge effect for a much cheaper cost because you’re getting the reward of topdecking it. It must play awesomely because I know that feeling of getting what you need when you need it and that’s what this mechanic is all about. Are you willing to put these cards in your deck if you aren’t able to cast them for their Miracle cost? This brings to mind Evoke creatures from Lorwyn. The way all the Evoke creatures worked was they had either a enters the battlefield or leaves the battlefield trigger than made them more than just a creature. However, for a spell cost, you got to get a spell-like effect if you didn’t want to or couldn’t cast the creature at the moment. How many people do you know play Divination when they could be playing Mulldrifter? The Evoke cost costs the same as Divination, but with the added bonus of being cast later in the game with a 2/2 flying body attached to it. Yes, there are some added benefits of flickering or bouncing Mulldrifter, but the fact remains that it can be cast either way. Thunderous Wrath is a Lava Axe that can also hit creatures and is an instant. And costs one more (that’s important too). Sure, the feeling of cracking it off the top of your library and casting it for a single Red is pretty amazing, but I don’t know too many people lining up to throw Lava Axes into their decks, especially if it costs more. It’s completely conditional if you have other ways to draw cards. These Miracle cards, for them to be liked, have to have an ability that people will want to sleeve them in their decks. Now, every card can’t be better than the last, but will players want to put these in their decks if they aren’t going to cast them regularly for their Miracle cost? I’m not saying this is a bad mechanic, but the payoff has to be more than sitting around looking at the card in your hand waiting to cast them because you missed the trigger. Certain decks/players will love these cards more (a dedicated damage deck will love Thuderous Wrath because you’re always drawing just one card a turn and will have a better chance of triggering). These are not meant to replace cards, but supplement them. If all of the Miracle cards are reactionary then you might have a hard time seeing this mechanic embraced. Zendikar’s Traps were pretty much the same thing (lower cost and triggered when an opponent did something), but now instead of waiting for an opponent to do something really rare, you get an automatic trigger at the beginning of each of your turns. Will this push this mechanic into “likable” territory? I don’t know. If the moments of topdecking the card you need outweigh the frustrations of having it sit in your hand, then I say yes. Again, we’ve only seen three Miracles, so it’s hard to completely tell where this is going. Could we see a Basking Rootwalla variant (A creature with a “Free” Miracle cost)? Depends on if all Miracles are reactionary or not, or if we’re going to see non-instant/sorcery spells. The set should have Miracle enablers (putting things on the top of your library, putting cards from your hand onto the top of your library, etc). How much of it is unknown. And it’s always dangerous when you create a mechanic that allows you to bypass the full mana cost of the card. Recent mechanics include Phyrexian mana and Cascade, while Affinity and the “free spells” from Urza’s Block still hang in the background. But powerful cost cutting mechanics haven’t always been the case, like with the previously mentioned Traps and Morningtide’s Prowl. Both of those had something in common: they could only be cast at certain times if you wanted the cheaper cost. 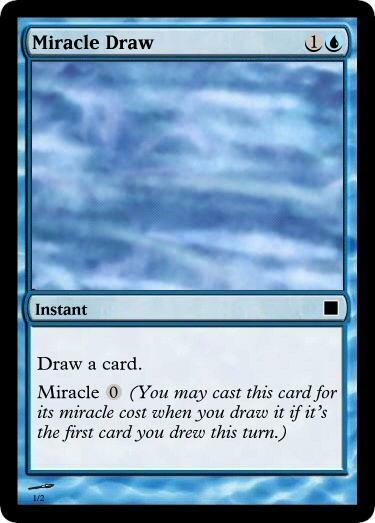 Miracle has similar restrictions and if this doesn’t become too powerful, I would expect this line of design (cheaper with restrictions on when you can cast) might become the better way to create those style of cards. Let me say this though, I do like the frames. I’m glad that WotC is taking a look a doing cool frames for mechanics like that. Not every mechanic needs a new frames. Could Miracle have done without one? Yeah, but they wanted a simple visual signal that you need to make your choice now when you draw it, so it’s a good choice. Spike – Abusing cards like Temporal Mastery will be key, but will hate “randomness” of losing to a topdecked card by an opponent. Johnny – Will love to manipulate the top of their library to abuse the lower costs, finding ways to make the draw trigger during oppnent’s turns. Timmy – It’s that Fiero moment that will keep them playing this card, though they’ll be frustrated each time they draw these cards when it’s not the right time, if only that they missed the experience. When I first read this mechanic I rolled my eyes. Great, here’s a rehash (and fixed version) of Banding and trying to make Slivers happen again. Now, I hate Slivers and felt that while Banding concept was good, the execution wasn’t well. Then I stopped and not let a snap judgement decide if I like this mechanic or not. You know what I figured out what this mechanic does? It allows you to play God. Alright, not really. I mean there’s only so much that you can do. There’s a bunch of interchangeable parts, something that Johnnies love very much. But there’s only so many combinations, and they all will eventually end up looking the same. They it hit me again. It lets you create your own Mr. Potato Heads. The drawback of only pairing two unpaired creatures instead of all of the Soulbonded creatures pairing with one super one makes sense, for exactly that reason. Yes, it’d be funny to make a 1/1 Spirit token suddenly an Akroma with 10 different Soulbond creatures in the battlefield, but it takes away from the flavor of the mechanic. These are supposed to be two creatures fighting together, not supporting one giant creature. That’s the difference between Soulbond and Exalted where you wanted everyone on your side to have Exalted and Soulbond can live by itself as long as there another creature in play. Soulbond makes two creatures more powerful than one, instead of the insistence of Banding and the Spice Girls of two becoming one. What Soulbond does is allow you to create whatever kind of creature you want to, as long as you have two of them. While it’s not really a Frankenstein’s Monster aspect, it’s more of the Mr. Potato Head example I posted above. Silverblade Paladin gives itself and another creature you control double strike. There’s also a creature that pairs with it a Ophidian ability (drawing when it does combat damage). Now you’ve got 2 creatures with double striking card drawing abilities. The abilities that we’re going to see are most likely combat related ones. Double Strike, flying, deathtouch, drawing when doing damage have all been spoiled. Wouldn’t be surprised to see haste, first strike, regeneration, intimidate, islandwalk, hexproof, trample, and P/T boosters. Much like our vegetable friend, there’s only so many different variants of more combat related mechanics that you can give to two creatures. They have to be scale-able and work well with two creatures, so “T: Draw a card” most likely won’t be seen. Remember, the whole goal of the mechanic is make creatures team up and fight against the bad guys; they really don’t care about you drawing cards. The really awesome concept of this mechanic: if your non-Soulbond paired creature dies, but your Soulbond creature lives, the next creature you cast can be paired with the original one. That’s where you get your card advantage, and a smart way to design these cards. You can play the Soulbond creature first, and if the creature you want to pair it with is in your hand, you don’t have to waste on creature on the battlefield. I think it’s small things like this that will make this mechanic little loved at first, but then grown to appreciate it. Much like how I felt when I first saw Soulbond. Spike – Depending on how aggressive the creatures are/what abilities they create depends on excitement. Will be sought after in limited. Johnny – The whole mechanic is an open puzzle. This is right in their wheelhouse. Timmy – The fact that you can give any dragon double strike and then when that dies you can give your newly casted one the same, means they’ll grow warmly with it. Like typical modern set design style, neither of the mechanics have too much to do with each other, but help describe and create the world that we’re now experiencing. Avacyn Restored is a nice change of pace for third sets and the apocalypse that rains down on those planes (Rise of the Eldrazi released the Eldrazi and New Phyrexia turned Mirrodin into, um, New Phyrexia). To make any of these mechanics work you have to have an environment that supports it. With Miracle I’m sure that there will be some cards that manipulate the top card of your library some how, but nothing too powerful. Soulshift already has the ebb and flow of the game to help with pairing, but the small theme of Flickering fits this mechanic into this set. I’m excited to see what other secrets the set holds. There’s potential of greatness for both, but as long as Miracle doesn’t end up too broken it should be one that will create great memories. Only time will tell if it’s powered just right. Some awesome MTGCP related news here. I’ve been invited to joined the Decked Builder RSS fed. If you have an iPhone or iPad, head over to the website and check it out. You can build decks and link it to your Dropbox on the go, and check out prices. It’s got a better interface than the official WotC Magic app which is a nice bonus. What I’m doing with Decked Builder is that you can read my posts on the RSS feed. You can read my work on there along with the big sites, which is pretty cool. And no, I’m not getting paid, as far as I know. So when I write on here you’ll always hear my voice, no one else’s. Miracles Rampant Growth, etc. seem unlikely. When’s the last time you *really* needed to top-deck a ramp spell? Why, why, why does everyone keep comparing Soulbond to Banding? What do the mechanics have to do with each other other than vaguely similar flavor? I don’t see how you can look at this keyword and see “Oh, it’s a new version of banding.” It’s not! They’re totally different! I think you just need to look at these mechanics a little more abstractly to see the simularities: All of these cards deal with “Entering the battlefield”. Soulbound is an obvious one, with lots of ETB triggers happening with it. Flicker, too. It’s not hard to see how Soulbound/Flicker is going to be really abusive in limited. Miracles are a little more abstract; afterall, it’s not like they “enter the battlefield”. But they do enter your hand, which is exactly when Miracles trigger. I really liked your point about Miracle cards “losing options” as a balancing mechanic. Traps aren’t quite the right analogy here, because got their reduction when they were really good to cast. (IE the player just drew a bunch of cards for you to trap them) Miracles are the opposite. Sure, sometimes your going to be ahead on the board so that extra turn is really brutal, but even when you get the miracle cost there’s no guarentee that you’re going to have an advantagous attack. Or maybe you won’t have the land for the land drop. Thunderous Wrath is similar. For dedicated burn decks, 5 to the head is something you always want to do, but for most other decks, burn is best used on opposing creatures. Wrath is going to make players choose between the cheaper burn now versus the 6xing the cost to cast it on a creature that really matters. The cards are obviously exciting, but I’m sceptical if they’ll play quite as well as they read. On soulbound, the obvious comparison are Auras. I mean, the game does already have a dedicated mechanic for “playing god” by building up a creature instead of an army. Soulbound guys are a really nice logical step for this. In fact, I’d be really happy to see an enchantment that hopped around nearly as well as these guys do. The fact that it’s only a “pair” stunts the harem notion of building a dedicated soulbound deck where you can throw abilities on a single hexproofer, but beyond that it’s a really neat idea.